Stretching over 350 miles, Oregon’s coastline is immense and varied. With the rush of Portland and Vancouver residents who to head to the beach, northern beaches are often crowded and hectic. For those looking to escape the crowd and to create some new memories, consider driving a little further to the southern coast. We’ve put together a three-day itinerary for Bandon, Oregon, that’s worth the mileage. Historic homes, empty trails, calm beaches, and sunsets that will leave you gobsmacked await! For your first night, consider setting up camp at Bullards Beach State Park Campground. A large full-service campground, this park has something for everyone. Yurts, hiker and biker sites, and RV and tent spots make any camping style possible. There are even equestrian facilities for horse lovers. Protected from coastal winds, there is ready beach access as well. Once you’ve set up shelter, head to the beach! Bullards Beach State Park is a family-friendly park with multiple picnic tables and group shelters for use. Stretching for 4 miles, there is plenty of room even in the busier summer months. For water enthusiasts, consider venturing out on the Coquille River. A lovely 2.6-mile paddle can be made by utilizing the boat ramp at Bullards Beach State Park. Tides dramatically affect this route, so consulting a tide chart before hitting the water is highly recommended. Once on the river you’ll pass under Bullards Bridge and get to witness restoration in action with the Ni-les’tun Unit of the Bandon Marsh National Wildlife Refuge opening on the riverbank on the right (paddling upstream). Coquille River Lighthouse is another worthy stop along this river system. One of 11 lighthouses in Oregon, the Coquille River Lighthouse was active from 1895 until 1939. The jetty here is an excellent place to view wildlife ranging from shore birds to cormorants and harbor seals. Tours inside the lighthouse are available during the summer season from mid-May through mid-September. For an ADA-accessible outing, Kronenberg County Park at Coquille Point provides gorgeous overlooks with viewing platforms and interpretive signs describing the unique bird life that exists along this stretch of coast. Look for murres, cormorants, and tufted puffins, depending on the season. And depending on tides, the beach is accessible by way of a massive set of stairs. Head out to Face Rock Scenic Viewpoint. Another ADA-accessible loop is offered here, as well as a steep set of stairs to the beach. Numerous sea stacks of all shapes and sizes make this a standout location to snap iconic Oregon coast photos. Sea caves are an added treat in this special spot. 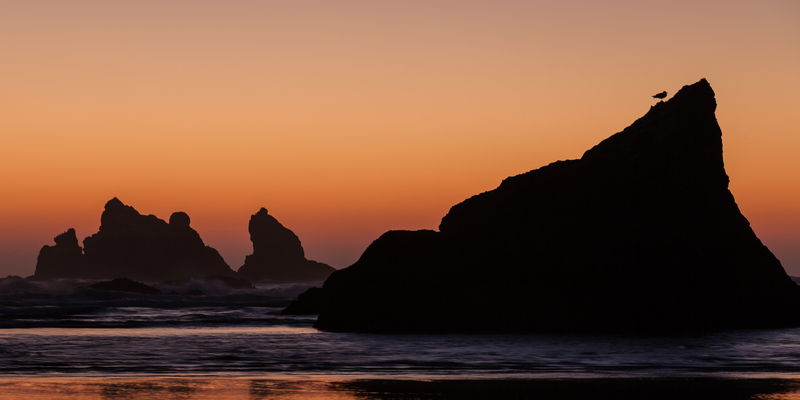 More dramatic coastal images can be captured at Bandon State Natural Area. Multiple access points from Beach Loop Road give visitors parking choices. Less visited than Coquille Point and Face Rock, the 3-mile stretch of beach here is a quiet retreat. The picnic tables at Devils Kitchen would make an excellent lunch spot as well. For learning more about the riparian habitats along the coast, no visit to the Bandon area would be complete without a stop at the nature center for the New River ACEC trails. An extremely odd riverway, the New River actually flows north and parallel to the ocean for a stretch before diving into the breakers. This is a birder’s paradise, as a wide variety of wading and migratory birds make use of this irreplaceable habitat. Multiple looping trails offer lots of options depending on ability and interest. With the available nature center at the Storm Ranch access point, this is an excellent adventure for families with children of all ages. For your second night on the coast, consider moving camp to take advantage of the first-come, first-served camping at Boice-Cope County Park. Smaller than the larger state parks, this little campground is ideal for windsurfers and kiteboarders taking advantage of nearby Floras Lake. If the wind is whipping, a trip to Floras Lake is in order for kiteboarders, windsurfers, and sailboarders. Separated from the ocean by only a thin strip of sand, wind lovers can take full advantage of the coastal gusts. If you prefer a more sedate outing, the Floras Lake Trail offers a opportunity to explore the New River Area of Critical Environmental Concern. Beach access is an option at several points along this trail, making it easy to turn into a full-day adventure if you’ve packed a lunch. Note that areas in the Bandon State Natural Area, New River Area of Critical Environmental Concern, and around Floras Lake are considered nesting habitat for the western snowy plover; dogs and other specified recreational activities are prohibited in certain areas between March 15 and September 15 to accommodate nesting and encourage the recovery of this threatened species. Before heading home, there’s still more fun to be found. Blacklock Point hike provides simply breathtaking views with very modest crowds. The muddy (and sometimes flooded) nature of this trail makes it less appealing for the masses. The views are worth it, however. Cape Blanco can be seen in the distance, as well as the historic lighthouse. For a more maintained trail experience, head to the River Trail. Only 2.0 miles in length, the path follows the Sixes River down to its mouth. For the best experience, time your trip with a low tide. With thousands of shore birds and feeding harbor seals and sea lions, there’s an abundance of wildlife. Even here, however, the trail can be difficult to follow at times. One last stop before turning inland; the historic home of Patrick and Jane Hughes is a must-see. Historic Hughes House was built by the couple 30 years after their arrival on the coast. Maintained by the Cape Blanco Heritage Society, tours are offered to the public during summer months only. Period furnishings make it easy to imagine how it must have felt to live in this Victorian home so many years ago. Volunteers are eager to share the family stories and describe the daily life on a dairy farm over 100 years ago.